Tuesday, September 4, 2012 . This shoot took place at Thomas Jefferson’s garden at Monticello. These incredible gardens are located in Virginia and have been grounds for experimental gardening and its own “slow food” movement for over two centuries. In 1977 Peter Hatch began his mission to restore Jefferson’s vegetable garden which had been replaced by a cut flower garden. This article is pretty amazing and follows Hatch and his dedication to bringing back 330 varieties of vegetables that Jefferson describes in his gardening book. It was obviously a treat to be a part of this shoot, actually a career highlight. Shot by Robbie Caponetto. I actually got to go in their greenhouse to style the shots with all of the seeds. I had the run of the place, which even for a seasoned pro like myself was pretty incredible.The day we shot all the beautiful vistas I took a ride down to the greenhouse, what I saw blew me away, tons of heirloom seeds being harvested by hand so I insisted on showcasing the tireless efforts being made to save these historical varieties. I gathered the crew and drove everyone to the greenhouse to document the drying room. The greenhouse offered almost perfect lighting. To produce this feature was a pleasure, I think even Mr. Jefferson would be pleased with the outcome. 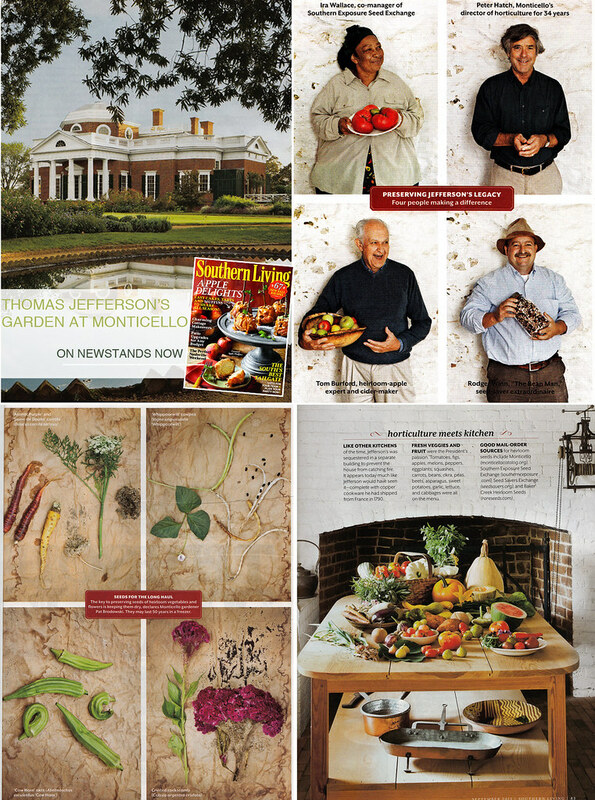 Pick up a copy of Southern Living September issue and see for yourself. Thanks to the staff at Monticello for being so hospitable and charming and a special thanks to the seed savers, without their help this garden could not survive. I’ll be back.